Curly Bird Express: Lake Michigan Give Away!!! The way I spin Batts depends on how co-operative they are. I might roll them up from wing tip to wing tip and spin from the tail end or head end like a fat round tube. I also might roll them up from head to tail then stretch them out gently to spin. Each way will produce a slightly different yarn when the Batt approves. What a delightful story behind a wonderful skein! ooooh, what a lovely contest! I am like you...I don't separate the colors of the batt. I love the unique yarn you get from spinning it as is. I tear my batts into strips to spin them. When I prep batts, I typically run them through My Precious two times too which automatically blends them up a wee bit more. That was a suggestion from Beth at the Spinning Loft. It is absolutely stunning....I have been looking for yarn to create something to remind me of my summers on Pleasant Lake in New Hampshire. What beautiful colors. How beautiful! I done spin - yet. I did take a class last year and my it is harder than it looks. But I am still determined to learn. I do knit and would love to knit up a hat or doll sweater from your beautiful yarn. 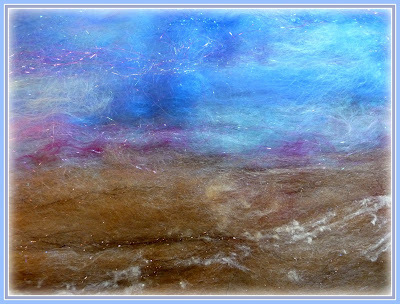 Beautiful skein and batt Melissa, the colours are so calming and sensual. I like to spin carded batts two ways, the first is tearing it into strips and pulling out as if to pre-draft slightly into longer strips keeping the same order of colours as the batt came in. The other way is to half the batt so I have one for each single of a 2ply yarn then spin directly from the corner of the half a batt drafting as I go. This technique works best with standard 2ply yarns but also with corespinning around a core thread of silk. WIth a ltitle baby on the way in a few weeks, a little boy, I'd love to make a little jacket, perhaps with one or 2 buttons near the top. When I spin a batt at night I start with the head so it can fly onto the bobbin. During the day I start with the tail and the motion of the whorl does not disturb it as it hangs there asleep. I believe winter has gotten to me, the phrase might be "Gone Batty!" I really have a problem selling my spun work. I'm just so darn attached to it. Your bat is beautiful and I love the colors in the finished work. That turned out really nice Melissa. Now I can't wait to spin mine. we are quite addicted to knitting here & have loads of birthdays coming up, it would be awesome if one of these gifts was made from your lovely yarn! i really admire your work & simply MUST learn to spin one of these days!! I actually haven't spun a batt yet. I have 2 I need to spin but 1 is so beautiful I worry about "messing" it up! Isn't that awful! I guess when I do spin my batt I will pull off sections. That is my next venture when I'm done with my spin madness bag! I'm such a novice drop spindler that I've no idea what some of the terms in the other comments mean. WIngtips and corespinnning? I've got my research project for the day! Meanwhile, I've only spun from roving, which remindes me, I don't even fully understand the difference between roving and a batt. I just hope to someday produce something as lovely as this yarn. Thanks for the giveaway. I confess I have not spun a lot of batts..but when I do depending on the batt I either tear it carefully in strips lengthwise and spin it or I may pull off a layer from the top and spin it that way. 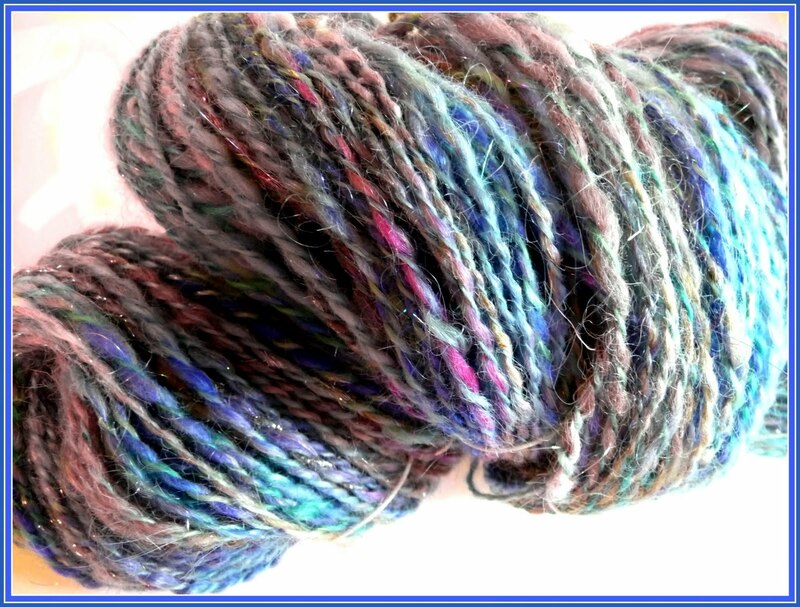 I love the the anticipation of seeing a beautiful batt and then be astounded at the yarn that is spun from it. Gorgeous batt Melissa. It shimmers. Whoa, kinda makes you want to pack up for a trip to the lake. Lovely! I would make a very simple hat to show off the yarn. a ribbed brim, basic stockingette stitch all the way up and a tassel or two to finish things off! I love to spin from the batts I make with my Louet Jr. I usually separate them into four sections, then draft them out a bit-getting all the juicy colors to create colorful varied yarn like what you've done. I would probably knit or weave it into a scarf. Beautiful yarn. Leaving in the cold Canada, I would knit myself a beautiful cowl with it. Wow. Gorgeous yarn, and I love all these ideas on spinning batts (diagonally?!!). I prefer to spin from a batt, and it all depends on the finished project/yarn I want to make as to how I prep it. Usually, I pull sections from the sides and act as if they're roving (after separating it into two horizontal halves for each ply). But, I also like layering a few batts and pulling strips OR, rolling the whole mess and predrafting from there. It can take a while for a batt to tell me how to spin it up! What an exciting post! I have never spun and would not know where to start. The yarn is absolutely beautiful and I would crochet myself a scarf!